And once again, I'm facing the boot dilemma. It is getting colder, and I must face the fact that I need a pair of boots. I hate buying boots and sneakers (except cowboy boots!). I think the last time I had the boot dilemma, I ended up buying a pair of sandals... ohh! How I love sandals! But well, Austria is not made for them... (not happy!) . So, now I need your help...which one should I buy?!! I know... the cut-out ones are not really warm boots... but they are so beautiful!! NEED #5!!! <3 Love the cut-outs, too cute! I got a similar pair from Choies that are inspired by those killer Alexander Wang booties. #2, #3, #4 are amazing!! The nr.5 is my fav! I definitely love the 5th ones ! Great selection of boot will wear any one. Love the Post!!! GREAT Boots!!! Great selection of boots! I definitely need to get some boots for Fall! Number 3 and 4 are my picks! Good luck. lets cling to summer for as long as we can. Gosh, the number ones! love it! Number 5 is great, but maybe 4 is much more comfortable. OMG I love these booties!!! Numbers 1 and 5 are my best!!! Number 5! I have a similar pair and they are perfect with dresses & jeans! ohhh 1 and 5 - wonderfull!! Jeffrey Campbell Everly is definitely my favourite! Oh my, time to think about those Boots again. I actually love wearing boots. Just not looking forward to the snow. 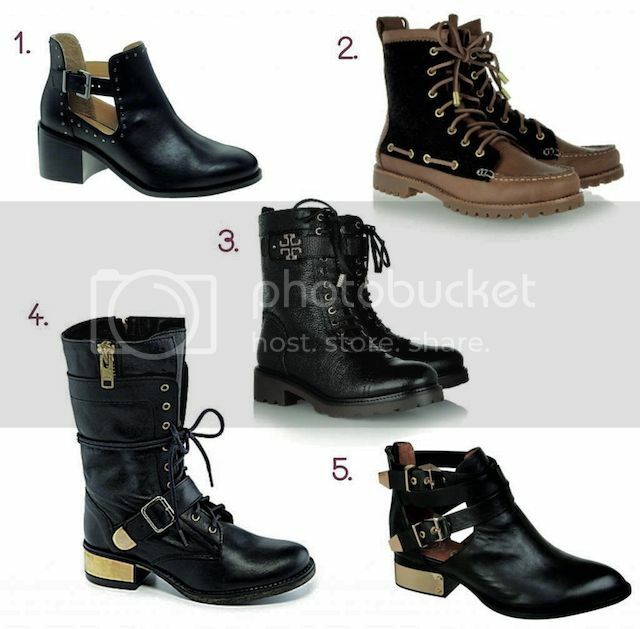 I really need some boots too...I love #1! They're not too practical for colder months buuuut they are super cute! Personally I love number 5, but I suppose once it gets cold those cut-outs won't be very helpful! i love those cut out boots! I would personally go for #3! 5, 1, 3 in that order are my favs. Too bad it's getting colder again. This problem that comes up every year.. Picking the right boots for fall! I like the number 2. These awesome Boots are the need for the fall and winter! Love them! Number 5 is my fav! 3 or 4 for cold weather. if you can deal with those openings Id say the last pair, #5! love those! Hey Ileana!! Same here :( Belgium is not also made for sandals :(( But at least in Austria you have amazingly beautiful mountains :))) Cheer up sweety :) I think number four would be the optimum choice....It looks good, most probably it would be comfortable too and it would save you from the cold :)....Love, Shomi! I love #1 and #5. Not sure if they'll be warm enough in the winter, but they are SO cute! And I'm sure they'll be warmer than sandals! #5 are my favorite! They are so elegant.